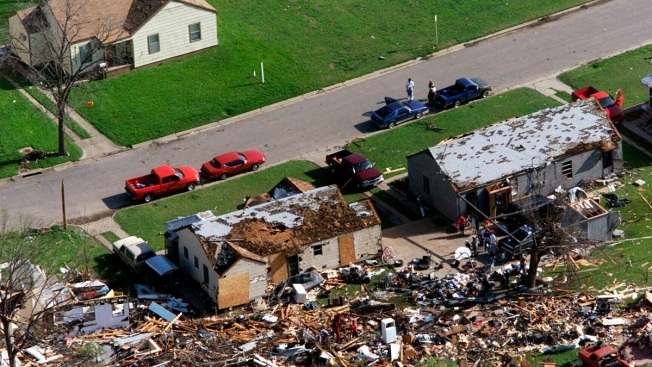 In this March 29, 2000, file photo, a house on the west side of Fort Worth, Texas, sits undamaged while homes across the street were severely damaged by a tornado that hit the area. It's been nearly 20 years since the tornado lumbered through downtown Fort Worth and experts say the deadly storm left behind more than just destruction. The Fort Worth Star-Telegram reports that experts say the twister in 2000, which caused an estimated $400 million in damage, triggered a valuable opportunity for business redevelopment and more housing. Insurance Council of Texas records show the tornado that killed two people in Fort Worth was the 21st costliest storm in state history. It's been nearly 20 years since a tornado lumbered through downtown Fort Worth, and experts say the deadly storm left behind more than just destruction. Experts say the March 28, 2000, twister, which caused an estimated $400 million in damage, triggered a valuable opportunity for business redevelopment and more housing, the Fort Worth Star-Telegram reports. Insurance Council of Texas records show the tornado that killed two people in Fort Worth was the 21st costliest storm in state history. "I think by the next morning we pretty much understood the scale of the damage that had occurred," said former Fort Worth Mayor Kenneth Barr. Initially 20 to 25 blocks of downtown were closed as concerns about falling glass from downtown skyscrapers continued. Phillip Poole, a Fort Worth architect and urban planner, said the storm provided an opportunity to redevelop along the West Seventh corridor. "I think it gave us an opportunity we probably wouldn't have had," said Poole, who heads TownSite, a real estate development firm that has done projects on the west side and Near Southside of Fort Worth. Tarrant Appraisal District records show that from 2000 to 2018, the value of the storm-damaged areas of downtown and the Cultural District increased 359 percent from $1.63 billion to $7.48 billion. "Nobody wants to experience a tornado but the destruction of that tornado forced people to think differently about redevelopment," said Fernando Costa, assistant city manager. Though it wasn't hit by the tornado, plans to tear down the old Ripley-Arnold public housing project and build a new Radio Shack corporate campus -- now Tarrant County College's Trinity River campus -- also helped persuade investors that downtown was ripe for residential housing, Barr said. "I think it probably would have happened without the tornado but maybe not as rapidly as it did," he said. "There are parts of it I like and parts that I don't but that's always the case."